Jason Savage, executive director of the group People Before Politics, sets up a sidewalk table outside the U.S. Post Office on Forest Avenue Tuesday while other members of his group begin to hand out questionnaires to passers-by. PORTLAND, Maine — Members of the new conservative organization Maine People Before Politics launched their Cut Spending Sidewalk Tour in Portland on Tuesday, and said the top concern they heard from passers-by centered on making welfare programs more efficient. But those handing out questionnaires in front of the U.S. Post Office on Forest Avenue also acknowledged hearing a call for more bipartisan compromise and common ground in Augusta from those who took the time to weigh in. 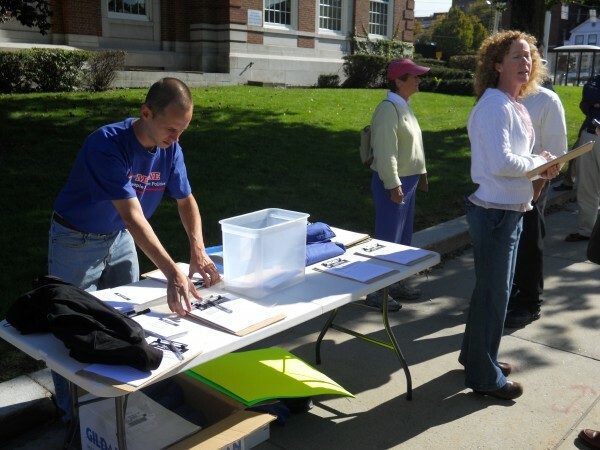 Maine People Before Politics volunteers offered passers-by opportunities to fill out forms identifying places where the state government can cut $25 million in the state budget, an amount a legislative task force is currently seeking to pare from the Maine spending plan. Those who filled out the forms also could offer suggestions on ways the state government could do its business better. The group formed several months ago with money left over from Gov. Paul LePage’s transition efforts and its name comes directly from one of LePage’s campaign slogans. Jason Savage, executive director of Maine People Before Politcs, said the information gathered from Sidewalk Tour stops like Tuesday’s will be used to form a report to be delivered to that legislative task force and the office of the governor. People can also visit the group’s website to submit budget cutting ideas. Future tour stops to be scheduled, he said, would likely be in the Bangor and Lewiston-Auburn areas. Among those approaching members of the public passing along Forest Avenue Tuesday was state Rep. Beth O’Connor, R-Berwick. She said people were telling her they are upset about the “corporate influence on government” and called upon lawmakers to reach across the aisle to find “common ground” — messages consistent with those being delivered across the city in Monument Square and Lincoln Park by members of Occupy Maine, a local offshoot of a movement launched in mid-September on Wall Street in New York City. Others distributing the questionnaires said welfare reform ranked at the top of the priority list for many who took the time to make their opinions known. “The biggest concern so far is welfare,” said Loretta Dyer, a Maine People Before Politics volunteer from Yarmouth. This summer, LePage created a Fraud and Abuse Prevention Team to root out abuse of Maine’s welfare programs. He also has pledged to take another swing at welfare reform in the coming months, possibly as part of a supplemental budget bill. At least a few people who stopped by the Maine People Before Politics table Tuesday weren’t suggesting cuts of any kind to help settle the state’s budget imbalance. Kathleen Brown, 21, of Portland said she wrote down on her questionnaire that the state should raise or implement taxes on products and services primarily consumed by out-of-state tourists, like ski lift tickets and lodging, to reduce the tax burden on Maine residents. An increase in the state’s meals and lodging tax from 7 percent to 8.5 percent was a central component in a tax reform package passed by a Democrat-led Legislature in 2009, but repealed by voters at the polls in June of 2010. Holt McCollister, a fellow Portland resident who filled out a Maine People Before Politics questionnaire, accused state officials of hiring cronies for top offices over better qualified candidates and said more subject matter experts in the halls of state government would know best how to cut the budget while minimizing the impacts on services. “I wrote about filling leadership jobs in Augusta with people who are qualified, instead of just the governor’s friends,” McCollister said.